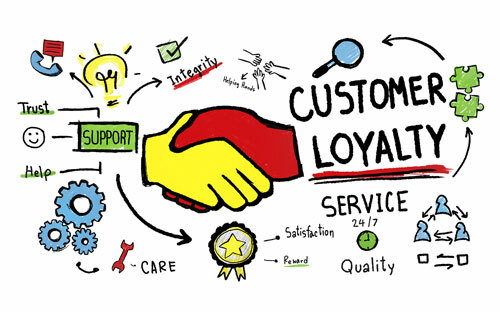 Customer loyalty is about ensuring a customer will come back to your business the next time, every time. The term “loyalty” usually brings to mind a long period of time; in other words, a lifetime customer. However, when I teach the concept of loyalty, I like to change the focus a bit. Don’t worry about a customer’s actions years in the future, focus on now. Or, more specifically, the next time. Social media has evolved rapidly and has become a part of most people’s daily routine. As people “talk” on these channels, they share experiences with those in their circle of friends and beyond. It would be foolish for a business to overlook the importance of using social media to its advantage, so how can you ensure your company is portrayed in a positive light? Most importantly, do a good job! Create a customer experience that is so good it makes your customers want to share it with others, online and by word of mouth. This will not only evangelize for your business, but also create loyal customers who continue to grow in number.